A team of skilled professors who are NET, SET and GATE qualified with all India top ranks. Quality classroom teaching and concise notes covering all the syllabus based on CSIR NET revised syllabus. Classroom teaching 2 hours/day (Monday to Saturday) and unit tests on every Sunday followed by discussion session. Special lectures allotted for part-A preparation. Emphasize on developing logical and scientific thinking. Three full length practice papers solving before the actual NET exam. Counseling and confidence building to face examinations and interviews. We conduct weekend classes on Saturdays and Sundays, 2 hours each day. Regular online tests, doubt solving sessions, Interview preparation and SOP writing. We also provide concise study material for these exams. 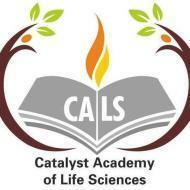 Catalyst Academy of Life Sciences [CALS] conducts classes in CSIR NET and SAT Coaching. It is located in Ghatkopar, Mumbai. It takes Regular Classes- at the Institute.